In my last post I talked about the events leading up to the publishing of the book, "The Limits to Growth". In this post (and the next few following it) I'll take a look at the contents of the book. For lack of a better way of organizing this I'll just go through the headings in the table of contents and consider the sections one at a time. The cover of my 39 year old copy of the book is shown to the right. This was written by William Watts, President of the publisher, Potomac Associates. It covers much of the territory I did in my last post, introducing the Club of Rome and their "Project on the Predicament of Mankind". To sum it up brief, the term "problematique" is used to sum up "the complex problems troubling men of all nations: poverty in the midst of plenty; degradation of the environment; loss of faith in institutions; uncontrolled urban spread; insecurity of employment; alienation of youth; rejection of traditional values; and inflation and other monetary and economic disruptions." All of these problems share three characteristics: they occur in some degree in all societies; they contain technical, social, economic and political elements; and, most important, they interact. Our predicament is that we can perceive the problematique, but are unable to understand the origins and significance of its many components and thus are unable to respond effectively. And this is largely because we tend to look at one problem at a time, rather than viewing the system as a whole. The study reported on in this book considers five factors that determine growth on this planet: population, agricultural production, natural resources and industrial production and pollution. Just a list of the figures in the book. Just a list of the tables in the book. One of the most significant things in the Introduction is Figure 1, the Human Perspectives graph, which I have included here. The two dimensions of the graph represent time (horizontal) and space (vertical). 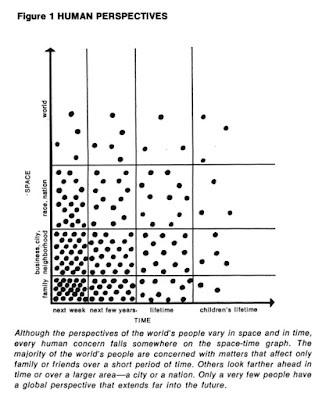 Each of the dots on the graph is a human concern and its position represents how far out in the future and how far away socially that concern leads us to look. The vast majority of people make decisions with consideration only to the next day or week and their own immediate family's welfare. All their resources are devoted to meeting the short term needs of themselves and their family. This may lead to making decisions that are less than ideal in the long run. Businesses and governments need to look farther into the future and be concerned with neighbourhoods, cities, nations and the world as a whole. 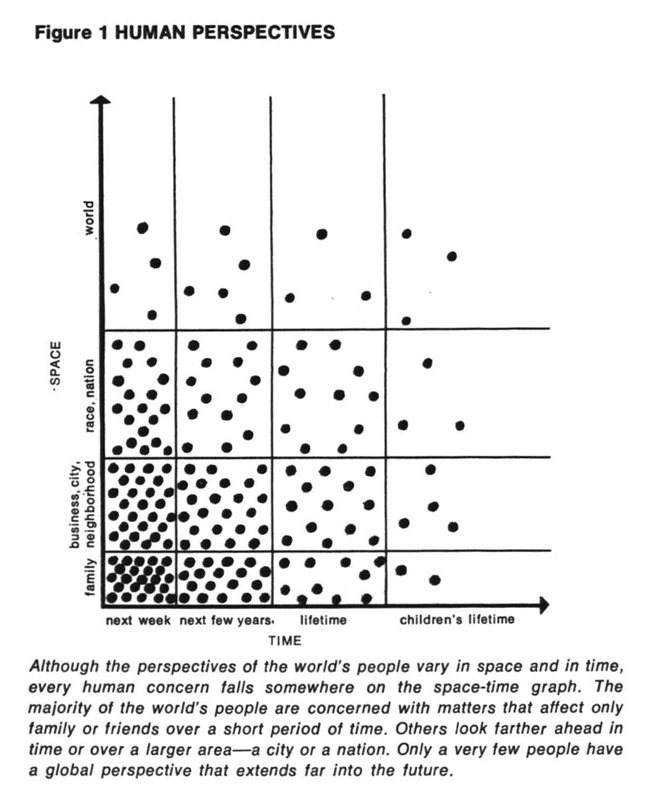 The authors state that their concerns in this book are in the upper right corner of the graph, taking the whole world in account and looking as far as the end of the next century (2100). I can't help pointing out that as we move away from the lower left corner of the graph it takes more and more effort to get accurate information on which to base our decisions—there is a trade off between distance and accuracy. Most of us simply don't have the resources to concentrate on the upper right corner of the graph, even if we are interested in looking that far ahead and outward. Businesses tend not to think much beyond the next quarter and the immediate part of society they deal with. Governments seem to be little concerned with anything beyond the next election and their own borders. That sort of thinking clearly has less than ideal results. What, then, do I think of an extremely ambitious effort like the study reported on in The Limits to Growth? A lot of resources went into the study and the authors are at considerable pains throughout the book to make us aware of its limitations. I think its critics are much too eager to dismiss what the study has achieved, primarily because its results are not what they wanted to hear. When any of us considers a problem we do it with the aid of a model of the world around us. Such models are inevitably simplification of the infinite details in the world, and as such, they are to some extent inaccurate. But even the informal mental models that most of us work with enable us to make moderately good decisions, at least some of the time. As the authors tell us, the model used in this book was formal and written, and while it was imperfect, oversimplified and unfinished, it had some advantages over typical mental models. Every assumption is written down so it is open to inspection and criticism by all. And after the assumptions were scrutinized, discussed and revised to agree with the best current knowledge, their implications for the future behaviour of the world could be traced without error by computer, no matter how complicated. At the time of publication the model was still preliminary, but even the implications of its result that were important enough that they could be withheld no longer. 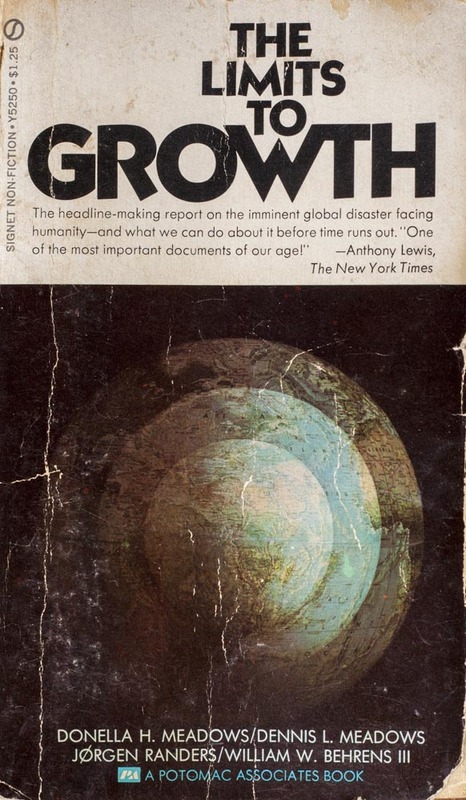 1) If the present growth trends in world population, industrialization, pollution, food production and resource depletion continue unchanged, the limits to growth on this planet will be reached sometime within the next one hundred years. The most probable result will be a rather sudden and uncontrollable decline in both population and industrial capacity. 2) It is possible to alter these growth trends and to establish a condition of ecological and economic stability that is sustainable far into the future. The state of global equilibrium could be designed so that the basic material needs of each person on earth are satisfied and each person has an equal opportunity to realize his individual human potential. 3) if the world's people decide to strive for this second outcome rather than the first, the sooner they begin working to attain it, the greater will be their chances of success. On the whole I agree with these conclusions and in the following chapters we'll see how they were reached. But before we go on with that, I'd like state a few important reservations. Forty four years have passed since this book was published and some observations can be made based on what happened during those years. In 1972 we were using about 85% of this planet's carrying capacity, so it wasn't too great a leap to conclude that, if growth could be brought to a halt, a sustainable situation could be achieved. Since then we have used up a good deal of the reserves of non-renewable resources and over-exploited many renewable resources damaging them in the process. All this has enabled us to grow to the point where we are at 120% of carrying capacity. The task that faces us is not just stopping growth, but a good bit of "degrowth" and a lot of work to restore the damage we've done to the planet. Of course, even "bringing growth to a halt" is a pretty big if. Here in the developed world we show no sign of willingness to give up a level of consumption that is obviously well beyond our real needs. And those in the developing world are certainly eager to continue developing and gain some measure of the comforts and convenience that we enjoy. One can hardly blame them, even though this is leading us directly toward the sort of collapse envisaged in conclusion 1. All five of the basic elements in the study reported in The Limits to Growth (population, food production, industrialization, pollution and consumption of non-renewable resources) were and still are increasing and following a pattern known as exponential growth. The book goes to some length to explain how this works and how difficult it is to model interconnected processes that are growing exponentially. Most of us have a mental model of how the world works that doesn't include exponential growth or the feedback loops that cause it. Crudely put, the shape of the exponential curve is such that it putters along in an almost straight line, increasing only very slowly for a long time. Then it starts to increase more rapidly and pretty soon goes right through the roof. In the real world, processes following this pattern of growth encounter limits beyond which they cannot be sustained, and either level off or collapse. Over the previous thirty years (1940-1970) the discipline of System Dynamics had been developed at MIT. System Dynamics recognizes that the structure of any system—the many circular, interlocking, sometimes time delayed relationships among its components—is often just as important in determining its behaviour as the individual components themselves. The world model discussed in this book is a System Dynamics model and takes those relationships into account. The answer to the question at the end of Chapter I would be determined by a list of necessary ingredients that can be divided into two main categories. 1) Physical necessities which support physiological and industrial activity: food, raw materials, fossil and nuclear fuels and the ecological systems of the planet which absorb wastes and recycle basic chemical substances. These are tangible, countable items which include arable land, fresh water, metals, forests and the oceans. 2) Social necessities such as peace and social stability, education and employment and steady technological progress. The rest of the chapter is spent evaluating the stocks of the items in category 1. Category 2 is dispensed with immediately, since these factors are more difficult to assess and cannot be dealt with explicitly at the current stage in the world model's development. The authors assumed that the best possible social conditions would prevail. No doubt this is a realistic approach as far as the capabilities of systems analysis at the time was concerned, but it seems rather optimistic to me in that many potential social problems are simply disregarded, especially in the light of what we have seen happen since. Originally I thought this chapter could be glazed over quickly, but on second thought, I would say it is the heart of the book, where we first looking seriously at limits. Several of the physical necessities for growth are considered in detail. Arable land and fresh water are among the primary necessities for growing food, and notable because there is a pretty clear limit to the available amounts of each, which at some point will limit the growth of human population. Arable land is considered in detail. Through most of our history there has been far more arable land than we could use. Even in 1970 only 1.5 billion hectares out of a total of 3 billion were in use. The remaining arable land was of poorer quality than that which had been already developed, but even assuming that twice as much food could be grown by using all of that land, our population was (and still is) growing exponentially—doubling in around 30 years—so in 30 years we would need all the production from all the potentially arable land. Technology can certainly improve yields (and did so in the years following 1970), but again, doubling the food supply would only gains us another 30 years. And quadrupling it would gain us just another 30. Each doubling becomes more difficult until eventually we are hard up against real limits. Improved technology also calls for increased capital investment and (as we can see 40 plus years later) has thus far been largely based on using non-renewable resources to increase agricultural yield. My thought is that the likely result of doing everything we can to increase the food supply is that when we finally hit the limit of food production, we'll be doing it with a lot more people to feed and significantly depleted resources left to solve the problem. Clearly, there is a fixed amount of these materials as well, but what the amount might be is far from obvious. Geologists talk in terms of resources and reserves. Resources being the amount of a mineral believed to exist, reserves being the amount that has actually been discovered and can be accessed economically with current technology. It is commonplace to divide the proven reserves of a resource by the current rate of use and proclaim the result as "the number of year of supply left before we run out". The authors refer to this as the "static index". They provide a large chart of the minerals used in industry and three different columns for the numbers of years of supply left. The first is the static index, the second is the exponential index, which takes into account exponential growth of the rate at which we use these materials and the third is another exponential index with the reserves multiplied by 5. The last is based on a future with the possibility of further exploration and improved technology for using lower grade ores. There are also 3 columns listing low, high and average estimates for the rates at which use of these minerals is growing. An old "Peak Oil" guy like myself can't help noticing that coal, natural gas and oil are on the chart and what exponential growth does to the years of supply left. But the authors chose chromium as an example because it has one of the largest static indexes of any of the minerals in the chart—400 years. Taking exponential growth of use into account, that gives an exponential index to only 95 years. If there were 5 times as much chromium as the 1970 reserves, that would be 154 years, and if we could somehow recycle all the chromium we use, that would only stretch it out to 235 year before we run out. 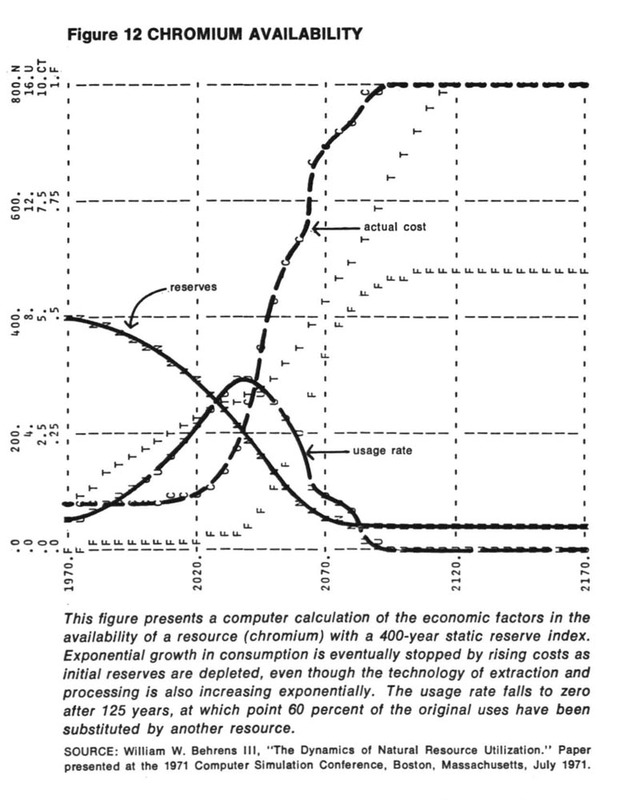 All these estimates are still static in the sense that they don't take the dynamics of supply and demand into account, so the authors created a detailed model that takes into account the many interrelationships among grades of ore, production costs, new mining technology, the elasticity of consumer demand and substitution of other resources. From this model comes Figures 12 and 13. 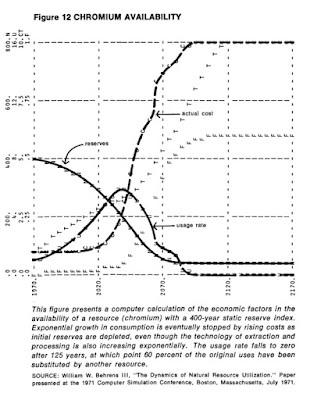 Figure 12 is a computer plot indicating the future availability of a resource with a 400-year static reserve index in the year 1970, such as chromium. 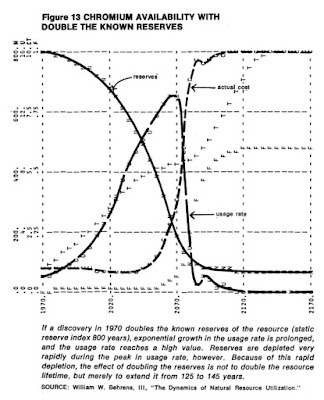 The horizontal axis is time in years; the vertical axis indicates several quantities, including the amount of reserves remaining (labeled RESERVEs), the amount used each year (usage rate), the extraction cost per unit of resource (actual cost), the advance of mining and processing technology (indicated by a T), and the fraction of original use of the resource that has been shifted to a substitute resource (F). At first the annual consumption of chromium grows exponentially, and the stock of the resource is rapidly depleted. The price of chromium remains low and constant because new developments in mining technology allow efficient use of lower and lower grades of ore. As demand continues to increase, however, the advance of technology is not fast enough to counteract the rising costs of discovery, extraction, processing, and distribution. Price begins to rise, slowly at first and then very rapidly. The higher price causes consumers to use chromium more efficiently and to substitute other metals for chromium whenever possible. After 125 years, the remaining chromium, about 5 percent of the original supply, is available only at prohibitively high cost, and mining of new supplies has fallen essentially to zero. This more realistic dynamic assumption about the future use of chromium yields a probable lifetime of 125 years, which is considerably shorter than the lifetime calculated from the static assumption (400 years), but longer than the lifetime calculated from the assumption of constant exponential growth (95 years). The usage rate in the dynamic model is neither constant nor continuously increasing, but bell-shaped, with a growth phase and a phase of decline. Figure 13 uses the same model, but starts out with chromium reserves twice as large. This changes the period during which the use of the resource is economically feasible from 125 to 145 year. In other words, double the original reserve only increases the period of use by 20 years. We can take all this as another story about how exponential growth works and how it can sneak up on us. The authors make this comment: "Given present resources consumption rates and their projected increase in these rates, the great majority of non-renewable resources will be extremely costly 100 years from now." 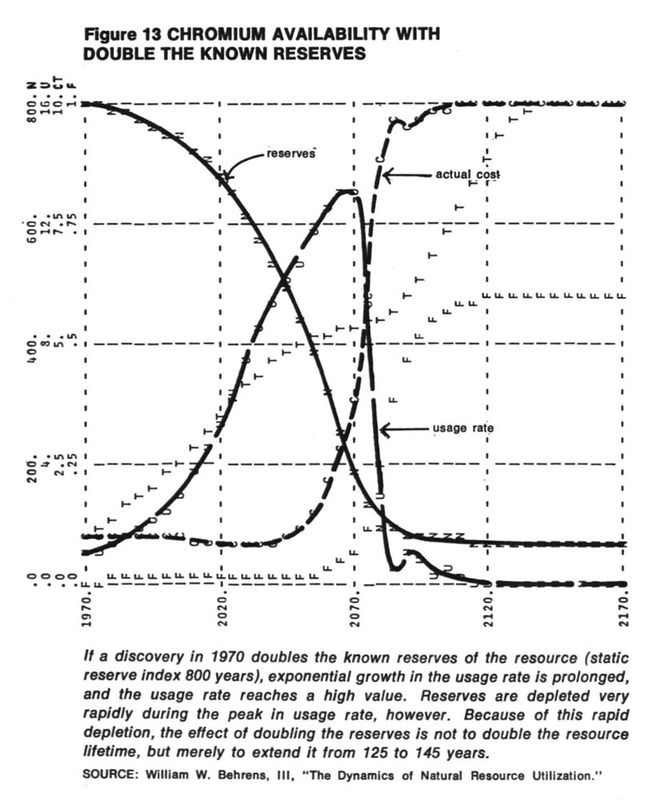 And they go on to explain that optimistic assumptions about undiscovered reserves, technological advances, substitutions or recycling make very little difference as long as the demand for resources continues to grow exponentially, driven by as they are by exponentially increasing population and industrial capacity. 1. The few kinds of pollution that actually have been measured over time seem to be increasing exponentially. 2. We have almost no knowledge about where the upper limits to these pollution growth curves might be. 3. The presence of natural delays in ecological processes increases the probability of underestimating the control measures necessary, and therefore of inadvertently reaching those upper limits. 4. Many pollutants are globally distributed; their harmful effects appear long distances from their points of generation. They go on to discuss several specific pollutants in detail. Among them are CO2 from the burning of fossil fuels and waste heat—the most basic by product of all processes that use energy. Both of these were growing exponentially. The authors include a chart that illustrates the very close correlation between energy use and gross national product, what is now known as the "coupling" of growth and energy use. In other words, if we are to have economic growth, we can't escape the resource depletion and pollution that comes with it. Nowadays "decoupling" is a favourite goal of the "business as usual" folks. This is the idea that through advanced technology we can continue economic growth without using more resources or creating more pollution. But there is no more indication that this is possible today any more than it was in 1970. The authors' conclusion is that while we do not yet know exactly what the earth's capacity to absorb pollutants might be, we know that there is an upper limit and regardless of what it is, we are approaching it exponentially. We have mentioned many difficult trade-offs in this chapter in the production of food, in the consumption of resources, and in the generation and clean-up of pollution. By now it should be clear that all of these trade-offs arise from one simple fact—the earth is finite. The closer any human activity comes to the limit of the earth's ability to support that activity, the more apparent and unresolvable the trade-offs become. When there is plenty of unused arable land, there can be more people and also more food per person. When all the land is already used, the trade-off between more people or more food per person becomes a choice between absolutes. In general, modern society has not learned to recognize and deal with these trade-offs. The apparent goal of the present world system is to produce more people with more (food, material goods, clean air and water) for each person. In this chapter we have noted that if society continues to strive for that goal, it will eventually reach one of many earthly limitations. As we shall see in the next chapter, it is not possible to foretell exactly which limitation will occur first or what the consequences will be, because there are many conceivable, unpredictable human responses to such a situation. It is possible, however, to investigate what conditions and what changes in the world system might lead society to collision with or accommodation to the limits to growth in a finite world. For me, this nicely sums up the message of the whole book. I'm not going to stop here though. In my next post I'll continue on with the actual world model for which the book is famous, and the results it produced. In the meantime, consider this: the problem might not be lack of resources or space, but that as long as we pursue growth, no amount of resources will solve our problems.